Cable Machinery Spares specialises in the supply of expert service, refurbishment and genuine spare parts for a wide range of cable making, wire drawing and braiding machinery together with ancillary equipment. We are exclusive agents for a number of well established brands - for full details of the extensive range of machinery supported, click on the links below. Babcock Wire Equipment manufactures heavy duty non-ferrous wire drawing and rod breakdown machinery. The equipment is robust and reliable, offering high productivity levels. B&F Carter manufacture a wide range of industrial braiding and cable making machinery. These have applications in a number of key manufacturing industries. Winget Syncro manufactures non-ferrous wire drawing and rod breakdown machinery and ancillaries. The equipment is robust and reliable, offering high productivity levels. Hanson & Edwards manufactures wire rope and cable making machinery, and is a leading supplier of both ferrous and non-ferrous stranding and closing equipment. Many of the above types of machinery have been in reliable, productive service with customers for 20, 30 or even 40 years! The secret to reliable, trouble free, high quality production is regular maintenance and service, using genuine spare parts that are specifically designed for the machinery in question. All our parts are manufactured to the original drawings and specifications and made of the correct grade of material to ensure robust and efficient operation. Give your production machinery a cost-effective performance boost - contact us today for more details. 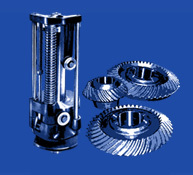 Spare parts and service are also provided for many other types of equipment. If you do not see the brand you are looking for above, please contact us for further details. August 2009: Cable Machinery Spares is now a division of Goodwin Machinery Ltd.